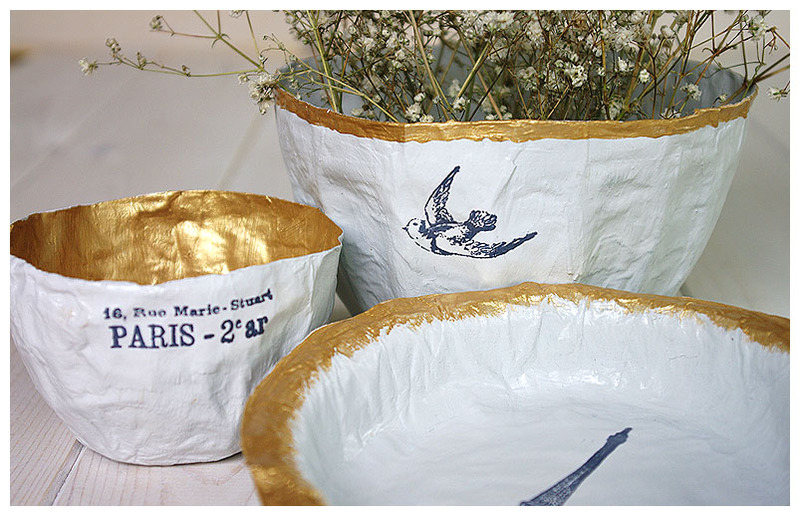 First I covered the outside of my bowls with cling film and mixed my wallpaper paste. With the help of the ruler, I ripped the paper into strips of around 2cm width. Then I started to paint the paste onto the individual paper strips and layering them on top of the cling film ensuring they snugly fit the shape of your bowl underneath. Try to smooth out any air bubbles. I started with a criss-cross pattern and then filled in any gaps and built the thickness up bit by bit. Don't make it too thick though as it will need to dry through. Once dried (that will take a day or two) you can still add more layers. Once all the layers have dried and after carefully removing the paper forms from the mould it's time to get painting! I experimented a little with different shades but in the end went with a pale grey, gold and some stamping. Once all the paints have dried, give it a coat of gloss. Hope you like it and it might inspire you to get crafting - maybe this weekend?